When used on concrete or steel separating floors such as Robust Detail E-FC-1, E-FC-2, E-FC-7 & E-FS-1, the acoustic battens must achieve a minimum laboratory performance of rd∆Lw=17dB. When used on timber separating floors such as Robust Detail E-FT-1, E-FT-2, E-FT-3 & E-FS-2, the acoustic battens must achieve a minimum laboratory performance of rd∆Rw+Ctr=13dB and rd∆Lw=15dB. Resilient battens must have a continuous pre-bonded layer with a minimum height of 70mm. One advantage of the advantages of the FFT-1 Resilient Composite Deep Batten systems is that services can be installed between battens. However they must not bridge the resilient layer on the battens. In most instances Robust Detail FFT-1 resilient composite deep battens must be overlaid with an 18mm (min) tongued and grooved board. This is usually chipboard but can be plywood or engineered hardwood flooring. However for Robust Details E-FS-2 a min 22mm flooring board must be used. A 5mm (min) resilient flanking strips is required around the perimeter of the flooring board to isolate the floating floor from walls and skirting. It is important that the manufacturers recommendations are adhered to for batten centres. 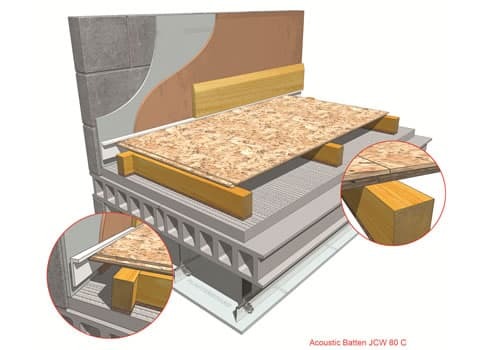 In timber separating floors such as Robust Detail E-FT-1, E-FT-2 & E-FT-3 a 25mm mineral wool and a layer of gypsum based board with a nominal mass of 13.5kg/m² is installed on top of battens prior to the 18mm (min) tongued and grooved board. This is done to add mass to the separating floor and improve airborne performance. As with any Robust Detail the correct external wall, separating wall internal wall and ceiling detail must be adhered to. The Robust Detail handbook should be consulted to ensure that the separating wall is compatible with the separating floor and vice versa. The Robust Detail checklist should be used to ensure that details are adhered to throughout each sequence of the build. All acoustic battens used by JCW have been tested in a UKAS accredited laboratory. When installed correctly robust details should exceed the requirements set out in Part E of the Building Regulations.